Happy Sunday! Shew! It has been a crazy week with work. This is the longest I've been away from the blog since I started over a year ago! Normally I'm able to work ahead or stay on top of things, but there simply weren't any hours left in the day. It's good to be back! So today I have two beauties from Glitter Gal. This Australian brand is best known for their beautiful, premium, fine linear holos. And Hot Chilli and Transfusion are no exceptions! 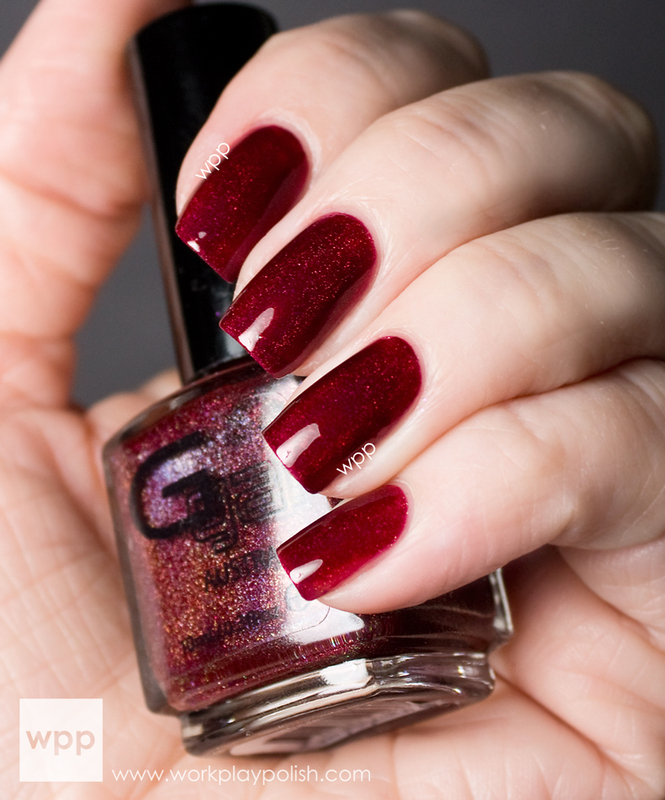 Hot Chilli is a deep, spicy red with a fine holo finish. It's perfect, really. I didn't want to take this one off! My swatch is two easy coats and a coat of Seche Vite. The finish is really amazing...much more holo than my pic shows. You can see it better in the bottle below. Transfusion is a deep eggplant purple. The holo effect is very similar to Hot Chilli prior to topcoat, but is diminished somewhat after topcoat. Unfortunately, I didn't take any pics before I added it. So keep that in mind. Still, it's gorgeous. Even though the holo is "undercover", it really gives it dimension. I know this came out in the summer...but in my opinion...it's a PERFECT winter purple. Love. Application was flawless - very smooth and buttery (and I love Glitter Gal's brush). What I like best about these shades is their glassy finish. They look almost like gels. Stunning. In addition to holos, Glitter Gal also carries a line of transition polishes (which transform a nail polish into a new and vibrant color), shade shifter polishes (metallic shades that reflect a different color at different angles), and duochromes (which have the same metallic shifting effect as shade shifters, but look best over black). GlitterGal polishes are 5-free and can be purchased by US, Canada and South America shoppers here. They are also carried by several of your favorite US and Canadian stockiest. Visit their store locator page for links. To keep up with new releases and promotions, be sure to follow GlitterGal on facebook and twitter!